The popular Rainbow Riches slot game comes in two different versions. 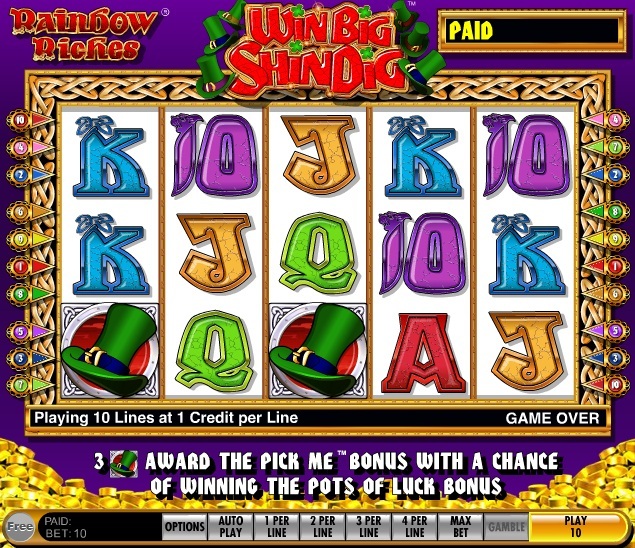 The not-so-well-known one is called Rainbow Riches – Win Big Shindig, which has a very rewarding bonus, but is frustratingly hard to hit. The two versions are very similar, with the same stacked wilds on each reel and many of the same looking symbols. To trigger the bonus round you need to first land 3 leprechaun hats on reels 1, 3 and 5. Then you pick one of the 3 hats to reveal either a multiplier of a bonus. It is the 'bonus' you want as you will be guided through to the 'Pots of Luck' screen where the leprechaun dances away and the pots spin round him. When they slow to a stop you will be rewarded with one of the bonuses, which can be 5000x your stake! Sounds great, but as previously mentioned, it is very hard to hit and it will take you many goes to get anywhere close. 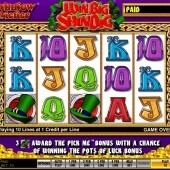 Rainbow Riches – Win Big Shindig is good, but not as good as the other the original in my opinion. This has more entertainment in it, with 3 separate bonus rounds and more ways to win. However, I do know that these two Barcrest slot games are hugely popular all over the world, Especially in Europe. You may have seen the Rainbow Riches slot machine in the casino. There are several different versions of this slot and it might not be the same game as those available at online casinos. For example, the slot machine I always see is the Pots of Gold one, which is actually more similar to the other Rainbow Riches slot from what I can make out.